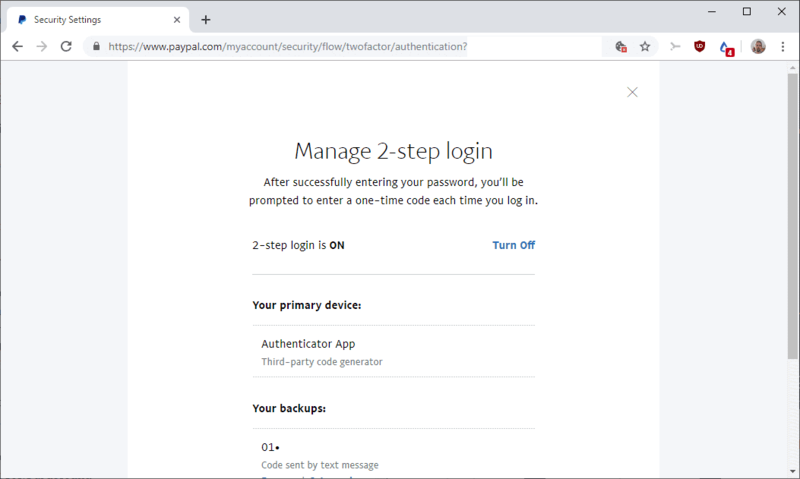 Find out how to set up an authenticator application for use with PayPal's 2-step login feature and use SMS as a backup. I use PayPal regularly. I wish I had another realistic option, as I’m no great fan of PayPal, but it’s the most commonly accepted payment scheme that allows me to avoid giving out my CC number. The sad part with paypal and many others is that they still retain fallback to sms or mail which is anything but secure (mail is beter than sms). What is the point of good locked front door if next to it is a sign “if you forgot your key the backdoor is open”. It’s alarming to be presented with a number of menu choices for logging in. Sometimes I wonder why I even bother fussing with an authenticator app. It’s becoming an art form, choreographing all of this. Finally! I can’t believe it took them this long. Of course it’s still a mess, though. The Android PayPal app asks for an authentication code every time I open the app even though I’ve already confirmed my phone and have it setup to use my fingerprint. Ugh. I was going to open a Paypal account for selling stuff on Ebay. Now I’m getting a little concerned about what may be wrong with Paypal. Is it safe to use like a Credit Card ? I’ve used it as my main online payment method (and to transfer money to individuals) for years and have never had a problem. The problems that I’ve seen with PayPal seems to happen if you’re a vendor, not an ordinary user, but I am not an expert on that. I’ve used it for years as a vendor and haven’t really had problems either. You do get customers trying it on and sometimes they get away with it but PayPal doesn’t simply side with them. Whatever service you use you’ll have some unhappy people. I use it if there’s no other way. I don’t keep a card stored there, just enter it each time, skipping PP and going directly to the card, which easily can be done. But I don’t use PP that much, so all that may be impractical for you. Many ebay sellers won’t take any other payment method. Never had problems with PP for domestic or international purchases and have had CC’s stored there for years in the past. Thanks for anwering my question. Glad to hear from people who already had experience with Paypal. No authentication here for accessing my PayPal account but of course a very strong password and a dedicated, reserved email address. Speaking of email address and the way transactions are processed from the seller to the buyer via Paypal : I recently purchased a software license and after having provided my name, snail mail address and email, having chosen PatPal, I was surprised to notice that the PayPal login displayed the email address I had given to the software seller, which was not the one I use for PayPal (given as noted above that I have a PayPal only reserved email address). I consider this bothering. I’d appreciate that credentials given to a seller be clearly apart from those reserved to PayPal. It is unclear to me if a seller is provided by PayPal my name and address when it appears PayPal is provided the email given to the seller. I may wish for instance to address a purchase to someone else than me, as a gift, and have that person be billed a 0.00 amount accordingly, in which case the name & postal address given to the seller wouldn’t match those of my PayPal account. But in this scenario does the seller receive from PayPal my PayPal name and address? I don’t buy much on the Web but when I do it’ll always be via PayPal because sending my bank account references over the seven seas isn’t a perspective I’m fond of. Paypal needs to leave legacy 2-factor/MFA behind. They need to embrace biometrics with certified liveness detection – now. These leftovers from the last 10-15 years of nearly no real digital security advancements means that now the attack surface has only increased. It’s no longer such a chore to obtain, one way or the other, someone’s typical credentials. And given Paypal’s transaction limits have been increasing significantly, it’s time for them to get more serious about providing stronger authentication that actually ties an account to the legitimate – and alive – user. Biometric security is a terrible idea. It’s a key you usually leave everywhere you go, and you can’t change it if it ever gets “stolen”. As for “certified liveness detection”, it’s only a matter of time before someone figures out how to spoof that too. Non-SMS MFA with an authenticator app and/or USB key are the way to go, for the time being. No, they don’t. Biometrics are not an acceptable authentication mechanism. Even doing SMS-based 2FA is more secure. Well this just get’s better. Some people still don’t have smartphones, let alone those mythical feature phones. In Canada, we still require landlines and VOIP for daily lives. Mobile phones can catch malwares and other goodies, if one is not careful. Not many people carry more than one mobile device. Lose it and you’re screwed. Prepaid mobile networks are lousy here in Canada. It would be nice if Paypal allows security USB keys to log in as two factor authentication or universal second factor. I prefer to keep my eggs in different baskets. Indeed they are, the reason why fees of mobile networks cost an arm and network. Shareholders and companies gouge customers. Using apps on a mobile device for authentication is neither secure nor does it improve privacy. But big business and government love tracking and want you to submit — and there are quite a few morons jumping on that train. I still use and like the security key. I wish eBay had not dropped support for the key. A major negative with PayPal is that they seem to be giving my PayPal email address to sellers, who then subscribe me to their newsletters or spam emails. Yes, I use a custom address for PayPal (and every other forum/app/subscription that I have), which is how I know that the subscription is coming from them. Sure I can change the address but then I have to jump through the verification’s and changing my records of the current address, which is annoying. PayPal should not be giving out user email addresses, anymore than they should not give out credit card numbers! PayPal support two-factor-authentication for years now. Nothing new here except there’s an app now and not just SMS or phone call options. I’ve been using paypal as a buyer & sometimes for selling things on ebay. (I have my list of passwords without them being connected to an account : ie NOT Paypal : fgsghsdkuhgsuhghfsjhdsfhsl but just the password which I remember goes with which account. The 2-step verification via SMS is a good advance in security. Whilst some people don’t like paypal, I like it as I can transfer money to my bank account & buy things without giving out my credit card number. This comment thread will end on r/Iamverysmart. Tom is a goldmine for OP posts. Sadly they have added geographical restrictions so if I have a PayPal USA account to make purchases in USA and have them shipped to my relatives, I cannot sign in. PayPal has stolen my money and frozen my account because I don’t login from the USA. They should allow this now that 2-factor authentication is added. There exists a workaround at https://medium.com/@dubistkomisch/set-up-2fa-two-factor-authentication-for-paypal-with-google-authenticator-or-other-totp-client-60fee63bfa4f that made PayPal treat regular 2FA apps (like Authy) as if they were an official security key, which was pretty convenient during the years when PayPal did not support other 2FA apps than Symantec’s. But nevertheless it’s great news that PayPal now has official native support for regular 2FA apps as well, judging by this article. I’ve been using the Symantec vipaccess workaround for 2FA TOTP for a few years now. 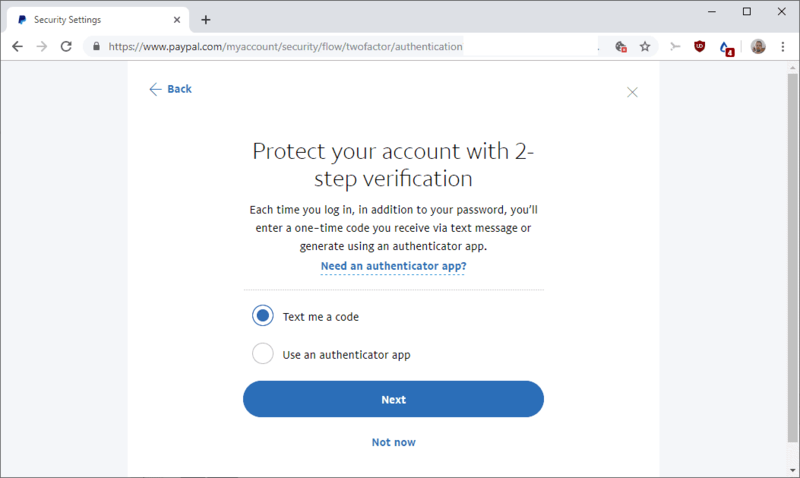 Glad to know that PayPal is finally adding official support for 2FA TOTP now. Better late than never! I don’t see this option anywhere in my account!